In late 2009 I was porting a largish prototype from jQuery to YUI3 and kept wishing for a cheatsheet to help me translate the idioms of one library to the other. 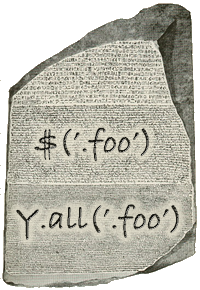 A few months and lots of expert help later, here is a Rosetta Stone for jQuery and YUI3. You can read and comment on the HTML version, download the PDF, or fork the project on GitHub. It is by no means complete or authoritative but I hope it's useful. This is a reference, not an evaluation or comparison of the libraries. If you have an opinion about which one is "better", that's great, but I don't want to hear it. jQuery and YUI3 only overlap in certain areas like cross-browser DOM manipulation, CSS, Ajax, etc. In general I think jQuery's convenience methods, core selector support, and method chaining are its greatest strengths. YUI3 also has selectors and chaining, but favors configurability, breadth, and support for complex applications rather than terseness.